The recent history of layoffs at Baker Hughes is particularly interesting since the company has had three tailwinds to deal with in the last 5 years. One is the oil price crash that affected oilfield service companies more than most. The next issue was the failed takeover by Halliburton. In November 2014, a proposed deal was announced to the value of $34.6 billion. This deal had a deadline of May 2016, at which time it expired. Industry insiders will remember that those 20 months were terrible for anyone involved in the upstream oil and gas business. Looking back, a successful takeover based on 2014 numbers would have been impossible during this period. Finally, Baker Hughes merged with General Electric which always has labour implications. GE owns 62.5% of Baker Hughes. In November 2017, just 4 months after the merger, the future of Baker Hughes again looked uncertain. John Flannery, the new GE Chief Executive that took over from Jeffrey Immelt said that he was looking for a way out of the deal completed by his predecessor. Pundits suggested that this was because of the cyclical nature of oil and gas, rather than issues with the company itself. In the clip, the newscaster mentioned a reason being "low prices at the pumps". Low prices per barrel probably had more impact on the upstream side of things than at the pumps. New drilling projects got delayed, and active wells became unprofitable. At NatResPro, we saw E&P activity crashing, and think that margins were still healthy at the downstream forecourts and pump stations. April 2015: Baker Hughes announced that it would be axing 10,500 workers (17% of its workforce). (This was after previously forecasting only 7000). The reason was down to the persistent low oil price during the crash. They also said that 170 locations were slated for closure. January 2018: A guidance statement regarding job losses in Oklahoma City was announced, with few specific details. The closing of a production facility in the south of Oklahoma City was cited as the reason. This building is involved in the companies artificial lift systems operation. It's anticipated that half of the employees will be able to move to other locations, and the other half will be invited to apply for other open job postings. It was acknowledged that there was an overlap in resources as a result of the GE merger. February 2018: The closing of the Buck Creek facility in Angelina County, Texas resulted in the loss of 78 jobs. The plant is up for sale at the time of writing. This was a small number of jobs, but still just as painful for the affected families. 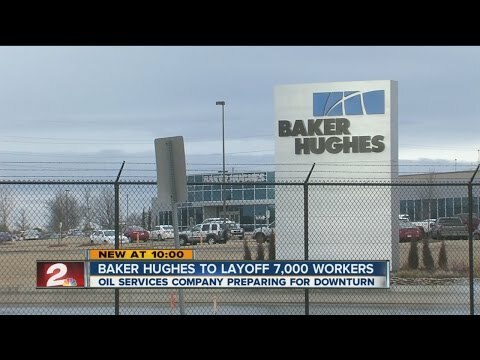 Baker Hughes has been doing their best to relocate and keep these people in employment. June 2018: The company announced the layoff of 266 people in it's Schertz location in Comal County, Texas. These job losses will take place between September and the end of the year. The reason given was related to the closing of the gas processing facility in Schertz.